Palvan-Darvaza is the eastern gate of the citadel Ichan-Kala. The ensemble was built in the years 1804-1806. The local people called the gate “Slave” as there was the slave trade. The gates were named after a local poet Palvan Mahmud who became the patron saint of the city. "Palvan" means "Hercules". Gates are decorated in the form of portal arch behind which stretches “dash-kucha” – “Stone Street”. 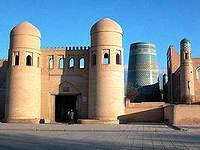 There is the inscription “Shahri Khiva” – “Khiva city” at the entrance. In 1835 the construction of the gates was finished by Alla-Kuli-khan. It is known that there was violence to the criminals, hence the name of the gate “Pashab darvaza” “Gates of execution”. Total area of the gate is 51,76х17,5 metres. Palvan Mahmud was the author of more than 300 rubai where he described life with all the joys and sorrows. Tomb of Palvan Mahmud is a place of worship over a period 700 years. In addition to the gate, the main channel of the city “Palvan-yab” was named after Palvan Mahmud. There were built madrassah with 99 hujras, caravanserai, as well as was completed the construction of Tashhauli palace.